If this judgement holds when, as surely it will be, appealed to the Supreme Court, and it is unlikely,one would imagine that the conservative majority on that court would overturn the Florida judges ruling,then that is the end of Obamacare. This is not a time for rejoicing,whilst of course conservatives, and one would imagine, the majority of Americans who polls showed,and the November elections proved, don’t like the bill. But no-what happened was the Democratic Party threw off its heritage to bow to the ego of “The One” who was able to say,however temporarily, that he succeeded where previous presidents failed, including Clinton, in getting a health care bill passed. Roger Vinson, A U.S. District Judge in Florida, has ruled Obamacare unconstitutional, not part of it either–the whole thing. Many have challenged its constitutionality from the beginning. Governor Palin, for one, has often referred to it as “the mother of all mandates.” Once again, this is America, and in America people cannot be forced to purchase anything. I reported here that U.S. District Judge Henry Hudson in Richmond, Virginia ruled that President Obama’s “health-care legislation goes beyond Congress’s powers to regulate interstate commerce.” It did not address other provisions of the bill. Today’s ruling, however, renders the entire bill unconstitutional. The existing problems in our national health care system are recognized by everyone in this case. There is widespread sentiment for positive improvements that will reduce costs, improve the quality of care, and expand availability in a way that the nation can afford. This is obviously a very difficult task. Regardless of how laudable its attempts may have been to accomplish these goals in passing the Act, Congress must operate within the bounds established by the Constitution. Again, this case is not about whether the Act is wise or unwise legislation. It is about the Constitutional role of the federal government. For the reasons stated, I must reluctantly conclude that Congress exceeded the bounds of its authority in passing the Act with the individual mandate. That is not to say, of course, that Congress is without power to address the problems and inequities in our health care system. The health care market is more than one sixth of the national economy, and without doubt Congress has the power to reform and regulate this market. That has not been disputed in this case. The principal dispute has been about how Congress chose to exercise that power here.30 Because the individual mandate is unconstitutional and not severable, the entire Act must be declared void. This is not over. It will be challenged and will probably go all the way to the Supreme Court. It’s good to know, however, that the Constitution still matters in this country. Had the Obama administration listened to the American people, and to Governor Palin who called it early–rather than choosing to ram health care down our throats in this manner–things could have been vastly different. One of our authors launched an exciting new blog last night called Alaskans4Palin. It features a gorgeous banner with a photo of Governor Palin with Lake Lucille in the background. Judging by the initial posts on the blog, there is a lot of talent there also. Tracey Porreca is administrator of Alaskans4Palin and also publishes her own personal blog, Finding Myself in Alaska. Tracey and her fellow Alaskan bloggers started the new blog to show the support for Sarah Palin that exists in Alaska. The liberal media in Alaska is snugly in the Democrats’ back pocket, so its coverage of Governor Palin is largely biased. Take for example, the snide article (which I will not link to) that the Alaska Dispatch wrote about the new pro-Palin blog. Alaskans, I am here to tell you that Sarah Palin is the real deal. We live in a difficult time, where information is so readily available and yet it is up to the individual, now more than ever, to be diligent in regard to where they get this information. In a time when media and political collusion can lead to corruption, Sarah stands as a true patriot with a servant’s heart. She desires only to see that the Great Land and our great country stand on a solid foundation. The constitutional principles that this great state and this great nation were founded upon are the very rock upon which she stands. Her faith in God, her love of her family, this state and its people, and her moral compass will not allow her to fall into the trap that has swallowed so many of our “leaders.” I support her because she is true to herself, to the people of Alaska, and to the people of this country. My hope is that through this site, you might realize what I and so many Alaskans who support Sarah Palin already do – she is a leader whom we can all stand firm in knowing will do what is right for Alaska and this country, no matter her future calling. Welcome to the Sarah Palin blogging community, Alaskans4Palin! 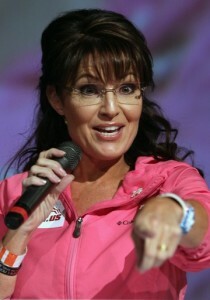 We look forward to reading articles about Governor Palin from a conservative Alaskan perspective. Above: Andy Barr. Lying, corrupt, left-wing hack. This is, of course, not true. Almost as soon as this BS story broke, a member of Free Republic, SFMom, posted that she attended the event and Sarah not only used her and her dad’s trademark line: “Don’t retreat, reload” but used it several times. Rebecca Mansour, who works for Sarah, confirmed via Twitter that the Politico story is “inaccurate” and Sarah indeed used her trademark line. Is it just me, or is anyone else just a little pissed off this twerp put the word: “exceptionalism” as in AMERICAN EXCEPTIONALISM, in quotes? Well, there are several. One, this lie creates the false narrative that maybe somehow Sarah feels guilty for an event she had ABSOLUTELY NOTHING TO DO WITH, or that maybe she is somehow “effected” or even “cowed” by the attacks on her from the vile left wing media, and the democrat party. It also gives Barr a chance to continue the lies and blood libel from the Tuscon shootings. To plant that little seed again, that Sarah IS responsible, AND now maybe realizes it herself. That’s how these corrupt bastards work. We make it habit of never believing a single thing written on the pages of Politico …. ever. We always consider anything they write an outright lie, unless it can be verified through many other sources, independently. It should be noted that while Barr himself may not have been a member of the left wing media conspiracy known as JournoList, Politico is lousy with corrupt JournoListers. Many who have conspired to write false stories about Sarah Palin, and cover up damaging stories about Barack Obama. The bottom line is: Sarah Palin has NOT retreated and has ALREADY reloaded. She’s loaded for bear and ready to take on the entire bunch. This little story does, however, serve to remind Americans nationwide that our media is corrupt, and can no longer be trusted. After we wrote this article, a bunch of people took to Twitter to tweet the news story around. Corrupt “journalist” Andy Barr scrubbed the website Politico of the story altogether. Barr has NOT publicly apologized to Sarah Palin though. Notice how Barr STILL refuses to apologize for his lie? More diabolically, since he scrubbed the first story, someone who did not see the original story might get the idea that Barr is just a good old boy “objective” reporter who is merely reporting both sides of the story. Notice he has no problem throwing the local reporter, who had no clue himself what Sarah did or didn’t say, right under the bus. This is how the corrupt media works. They lie all day long, and when caught red handed, just erase the lie like it never happened. BTW, Barr DID leave up the nearly 400 hate-filled comments from the left wing loons that read Politico. Make sure you read those. They represent the “cream of the crop” of the democrat party. These sort of people do not deserve to have a job in the news business. At best Barr should be asking diners if they want fries with that burger. He represents everything that is wrong with journalism, as does the corrupt left wing publication that employs him. Again, feel free to let Barr know how you feel. Sarah Palin continues to position herself as a presidential candidate, firing back at Barack Obama’s State of the Union Address. Many in the mainstream media were judgmental of Palin’s use of the acronym, some even going so far as labeling it un-presidential-like. However, I think many Americans were thinking that exact same thing, which is why I admire Palin for having the gravitas to come out and say it. And for those who think the former Governor can’t back up her words, Palin stepped to the plate on Thursday with a lengthy and critical Facebook note that was spot-on, pointing out many of Obama’s WTF moments. As Palin continued to tackle the lack of jobs, the issue of hitting job-creators with a tax increase, and Obama’s “half-baked ideas on where to spend our hard-earned money in pursuit of “national greatness,” it’s clear to anyone that Obama’s view of American exceptionalism is completely different than that of Palin’s. Safari Club International is an international organization composed of hunters and claims to be the world leader in protecting the freedom to hunt, so it was no surprise that the Safari Club snagged one of the most sought after speakers on the circuit for their event–Sarah Palin. Palin delivered a 40-minute speech to about 2,500 members that ran the gamut from the delicate balance between hunting and fishing to second amendment rights to responsible conservation to the importance of local governments in setting policy. Of course, Palin got some of the biggest cheers from the crowd when she stressed how her family hunts to fill their freezer. Last year, former President George W. Bush offered the keynote address, but this year, Palin proved that she personally understands the importance of protecting the environment and that hunting and fishing are part of America’s heritage and the country’s exceptionalism. So says Haaretz Newspaper in Israel. There is no need to go into great historical detailed analysis, the basic facts are that the inexperienced President Obama made the liberal wishy washy decision to go soft on Islamicism in his fatal Cairo speech. Then when push came to shove he didn’t make the all out effort to temper the Mubarak regime, nor did he stop his foot in mouth VP Biden from saying Mubarak wasn’t really a dictator. Can anyone now say that Palin as VP could have possibly been any worse than Biden? Now the US is flip flopping all over the place, pleasing nobody and possibly laying the groundwork for a radical islamicist regime which will add to the coming “ring of Islamicist states” as the predicted outcome by an Imam yesterday. I would prefer to have the other woman, Palin, in the White House at this time, or rather, two years ago, but Clinton would have been better,if we had to have a Democrat, than what we now have. This site is honored to institute the annual “A Poem For Palin” competition. Not only does the Obama administration have “Blood on its hands” because of Bernanke’s Reserve Bank profligacy as set out in the analysis by economic commentator Mike Shedlock, but also because it chose to ignore warning after warning to not keep propping up Mubarak (“He’s not really a dictator” said Biden). Former Deput Assistant Secretary of State Scott Carpenter said today that “The Obama administration had better get off its talking points” and do something to assist the Egyptian people to work towards a democratic administration. The alternative, and the path the Obama administration seems to be choosing is to have a radical Islamic region. The public must be having severe ” buyers remorse” regarding the outcome of the 2008 election-one can’t imagine a McCain/Palin administration managing this situation so poorly.